So, this is a bit of a departure, but I'm gonna go ahead and count this as a "horror movie," so here you go. 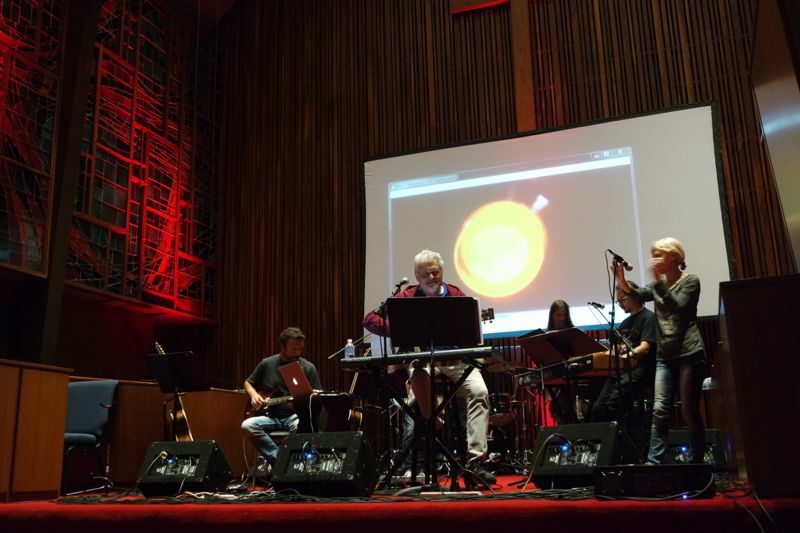 Last Friday night, I went and saw the Italian composer Fabio Frizzi perform a selection of music from his forty-year career scoring horror movies. It was the opening night of MondoCon, and it was incredible. He was a frequent collaborator with the director Lucio Fulci, whose work I love. They collaborated on some of the best: Zombie, The Gates of Hell, The Beyond, Manhattan Baby, A Cat in the Brain, and many others. Hell, even if you don't love weirdo Italian horror movies, I'm sure you've heard his work-- Quentin Tarantino is a huge fan, and used one of his songs in "Kill Bill Vol. 1," the title song from Fulci's "Seven Notes in Black." If you'd like to refresh your memory, it's on YouTube. It's great. The concert was a real experience. I'm a huge fan of both Fulci and Frizzi, so I went ahead and got the super-fancy tickets, which came with a small lathe-cut 7" specifically created for this concert (and with a run of only 50 copies), and came with a meet-and-greet with the man himself. I shook his hand and thanked him, and he signed my copies of his albums on LP. I also literally sat in the front row. The show was in the Central Presbyterian Church in downtown Austin. The fancy-shmancy tickets also came with early access, allowing people to show up three hours before the show and watch the sound check. When I walked through the doors, the band was all set up on the stage, and light was streaming through the stained-glass windows. Watching them run through snippets to make sure the acoustics of the church sounded as good as they possibly could was amazing. The show itself was amazing. His backing band was on point-- aside from Frizzi himself, I was blown away by two people in particular: the bassist, Roberto Fasciani, who could range from laying down the funkiest of 70s lines all the way to trilling solos; and multi-instrumentalist Alessio Maestrale Contorni, who was on the keyboards all night, but kept picking up other instruments and just shredding on them, including a straight-up mindblowing jazz flute solo. My shout-outs to those two in particular should in no way diminish everyone else in the band, who were all absolutely incredible. The show was paired with snippets of movies projected onto the screen behind the band, allowing their live playing to sync up with the action that the music originally accompanied. It was amazing to see the band shred through the classics, and great to see a "greatest hits" of Fulci's horror (the zombie vs. shark scene from Zombie; the splinter in the eye from same; "Seven Notes in Black," of course. At the end, Frizzi called out, "There's one thing we did not do. Do you know what it is?" In unison, the crowd shouted out "The Beyond!" Frizzi laughed-- perhaps he'd been expecting the Italian title, "L'Aldila--" and said "Yes, yes, The Beyond." Then they straight-up shredded out the score from The Beyond. Deeply satisfying. I was delighted to experience this, especially as opening night of MondoCon. I'm so appreciative of Mondo, Death Waltz, and Frizzi himself for putting this together.